Fake things can still be beautiful things. 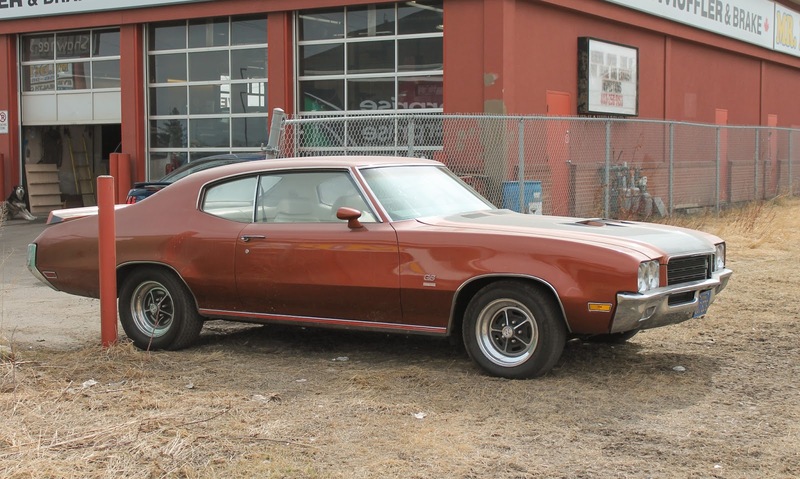 And proof of that statement can be found in today's 1971 Buick GSX "clone." 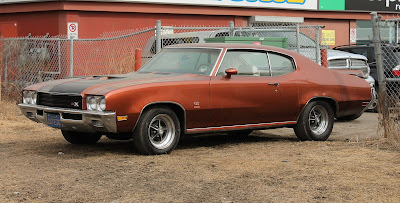 There were only 124 genuine GSX 455's built in 1971 and it's doubtful that any of them are hanging out behind a strip mall on a chilly Calgary afternoon. But none of that matters when you look at it. That gentlemanly yet muscular shape is flattering no matter what its true pedigree is. While it wears proud GSX badging, this car is missing the GSX's hood tach and side stripes and features incorrect headlight bezels. In all likelihood this car is a GS 350 that's been boosted to artificial GSX status. 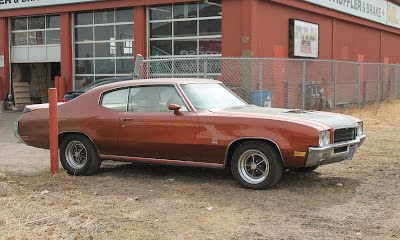 But a Buick 350 has the same external dimensions as a 455 and they both have a lovely burble so who would ever know? A real GSX can be seen for comparison in all it's striped and spoilered glory here. We'll continue to refer to this one as a real GSX as an excuse to discuss one of the baddest muscle cars of all time. In 1970, when the GSX was in it's high-compression Stage 1 fighting prime it's monstrous 455 V8 kicked out a hilariously underrated conservative 360 horsepower and a daunting 510 lb/ft of torque. For comparison, the vaunted 426 Hemi only made 480 lb/ft. By 1971, lower compression had somewhat diminished the output of the mighty 455. The standard 455 put out 315 horsepower and the higher strung Stage 1 still made 345. As always, it was the earth-moving torque rather than all out horsepower that made these Buicks so lethal. 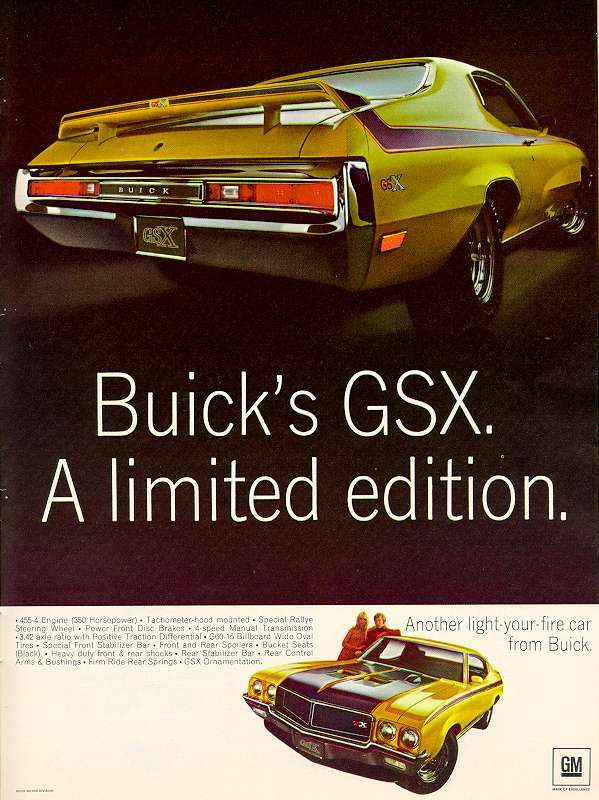 The GS and even the wilder GSX were marketed as "gentleman's muscle cars" during the height of the muscle car wars. 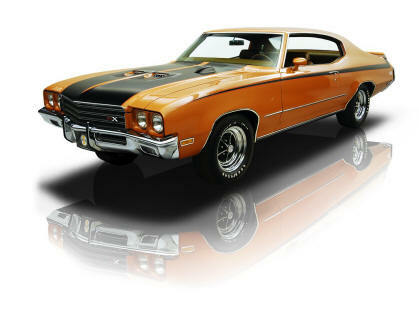 They were certainly more refined and restrained than the crude, street brawling 'Cuda and Chevelle. But the reason that they're special, is that they were every bit as quick as any of the big-block straight line missiles out there. A limited edition indeed.